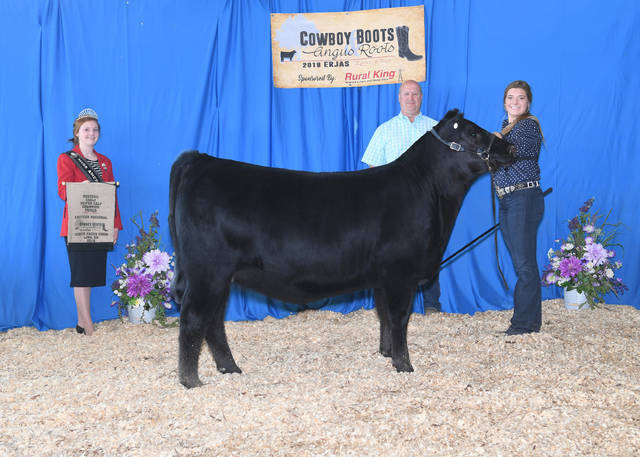 SCC SCH Phyllis 792 won “owned reserve early heifer calf champion” at the 2018 Eastern Regional Junior Angus Show, June 15-16 in Lima. Kinsey Crowe, Eaton, owns the winning heifer. Photo by Linde Sutherly, on behalf of the American Angus Association. https://www.registerherald.com/wp-content/uploads/sites/41/2018/07/web1_heifer.jpgSCC SCH Phyllis 792 won “owned reserve early heifer calf champion” at the 2018 Eastern Regional Junior Angus Show, June 15-16 in Lima. Kinsey Crowe, Eaton, owns the winning heifer. Photo by Linde Sutherly, on behalf of the American Angus Association.